PSYOP Regimental Blog: Counterespionage – An Indicator of Effective Influence? Counterespionage – An Indicator of Effective Influence? 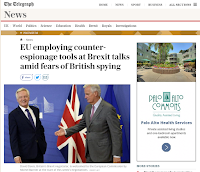 The July 19, 2007 edition of the UK publication Telegraph (see: http://www.telegraph.co.uk/news/2017/07/19/eu-employing-counter-espionage-tools-brexit-talks-amid-fears/, which is also the photo source) ran an article “EU employees espionage tools at Brexit talks amid fears of British spying”. The article talks about the security concerns of the EU BREXIT negotiating team. The implication is that the EU is concerned that Britain would employ unfair means to learn about the plans and intentions of the EU team. Is it possible to interpret this in another way? Increased security efforts reflect a fear that the ‘enemy’ is gaining an advantage in the ‘battle’. In this case the battle is over the terms of the British exit from the EU. In other situations, Venezuela for instance, increased actions against opponents are often cloaked in security terms when the real motivation is that the enemy force is winning the influence battle in the mind of public opinion. PSYOP is Sensory – Ask Iran! Cuban Sonic Weapon Aimed at US Embassy?